If you order carnitas at a chain burrito place, you will likely get roasted, shredded pork shoulder. For Marcos Carbajal, that's like using "barbecue" to mean only one kind of meat. 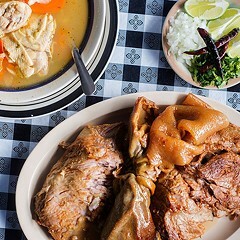 "There's shoulders, there's ribs, there's pork belly, there's pork skin," he says, pointing to each on a styrofoam plate we've just been handed at his family's restaurant, Carnitas Uruapan in Pilsen. "Usually the shoulders and the ribs are the top two choices for beginning eaters. 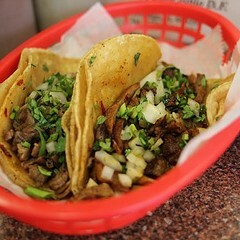 But at a more advanced level of carnitas eating, a lot of people like more of the skin, even as far as some of the organs like the kidneys, the liver, all of it. We cook the whole hog." He puts together a taco containing shoulder, some of the belly (more rubbery than pan-fried bacon) and a little of the near-gelatinous skin, then douses it all with some of the house-made salsa. "The specialty cuts are only available first thing in the morning," he says. "They sell out pretty quick." Eighteenth Street near Ashland is the epicenter of carnitas in Chicago, and Saturday morning, as lines pour out the doors of all the popular places and families stock up on pounds and pounds of deep-fried pork for the weekend, it's one of the great Mexican food scenes in Chicago. And in Carbajal's kitchen the scene is even more eye popping; mounds of huge pork cuts bob up and down in giant fryers the size of piggy hot tubs as Carnitas Uruapan's cooks stir with what look like canoe paddles, specially made in Uruapan, Carbajal's family's hometown in the state of Michoacan. Marcos's father, Inocencio Carbajal (known as "El Guero" in the community, for his light skin), came to Chicago as a young man in the early 1970s. He stayed with another emigre from Uruapan, Sabas Vega, whose namesake carnitas restaurant is still around the corner on Ashland, before launching his own place 40 years ago this year. "My dad started in the carnitas business in Uruapan when he was about 13," Marcos says. "He started off helping my uncle and my grandfather with a butcher shop they had that made carnitas on the weekends. When he came to Chicago, he worked in the West Loop at some of the meatpacking places there, and saved everything he could so he could open Carnitas Uruapan." Two friends who had spun off their own meat company lent him his first two months of meat to help him get started. "He started off slow—he said he'd have carnitas for breakfast, lunch and dinner," Marcos says. "There was a Mexican supermarket, really the first one, across the street, and he'd chase after people as they were leaving with a sample of carnitas to try." 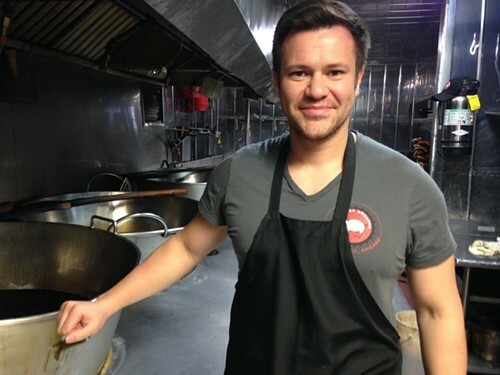 Marcos, 31, grew up living over the restaurant and working in it from a young age—"I've been involved with the restaurant pretty much since I was born"—but he was happy to get away from it by the time he went off to the University of Michigan. He worked for a major financial company for about seven years, but having grown up the son of an entrepreneur, he harbored ideas of having his own business someday. While he contemplated that, he had to confront the fact that his family already have one. "As my parents have gotten older, the topic came up of succession planning and what was going to happen to the restaurant," he says. "I'd never fully stepped away, I'd always helped out when, say, my dad would go off to Mexico, and I decided I was having more fun running the restaurant, and I saw more potential there." But down the road—once he finishes grad school—he sees opening additional restaurants. He looks forward to improving their layout, which right now involves a line that weaves through the restaurant, squeezed between the people crammed into booths, and he talks about expanding the menu to some degree. But he knows that, as nice as the non-Mexican foodie attention is, his core audience will remain Mexican diners and neighborhoods, and he doesn't want to travel too far from the family recipe and the dish that built the restaurant in the first place. Despite a modern tendency toward healthier eating, what packs the place with hungry people every weekend is deep-fried pork. "Even in Mexico, it's seen as a splurge," he says. "It's a weekend dish, and people view it as their reward at the end of a long week." But it’s a serious contender in the little-meats game.